Modern technology can sometimes be an unwanted change, especially in the workforce, but in the case of the modern healthcare workstation, this simply isn’t the case. The ability and convenience of having a mobile desk in the healthcare sphere has helped nurses and doctors administer better care, save time, and deliver an overall better service to patients. What functions does a modern healthcare station perform and what does it look like? Workstations on wheels can include a combination of a computer and several drawers for storage use. Point of care carts can be used in a variety of different ways, but its importance lies in inputting patient data. While the workstation can operate the way a normal desk would, the ability to move the desk from patient-to-patient allows nurses to input all information once and to do so in a professional manner. This includes no more handwriting interpretations, losing patient’s sensitive data, and correctly highlighting and flagging any allergies the patient may have to medications. In the past, a nurse would take down a patient’s information with a clipboard and file this information somewhere in a manila envelope among hundreds of other patient names, somewhere in a heavily packed storage closet. Even for those companies who have switched to holding patient information in a database, this still causes staff to have to re-input data and duplicate efforts: entering information once on paper and then a second time on the computer. The workstation on wheels eliminates these redundancies. How do mobile drawers help healthcare workers and patients? While mobile computers help organize patient information, mobile drawers help to organize doctor’s offices. Drawers can serve a variety of purposes including housing medication or providing quick access to health-related instruments. When a patient’s waiting room is designed differently depending on which room they enter, organizing each room cohesively can be a challenge. 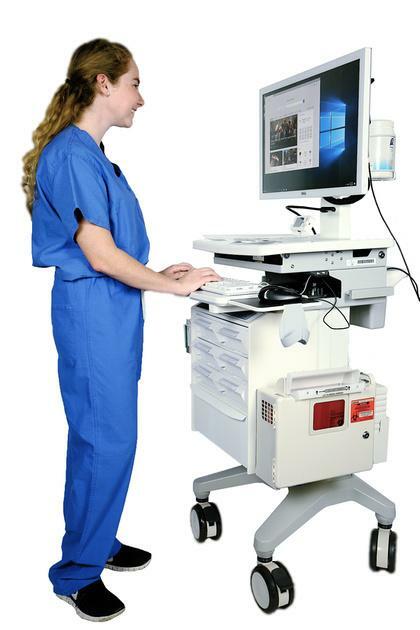 When a doctor or nursing staff needs something quickly, a workstation on wheels is a far superior means of retrieving it. Drawers can be labeled and won’t change their positions. Saving time is known to save money, but what does saving space get you? The ease of workflow created by the workstation on wheels is a convenience that is hard to put a price tag on. Computers don’t need to be in every room. Instead, they can move from room to room as needed. Many modern workstations are also battery operated and are wireless helping to ease the burden of wires being snaked throughout a room. Ultimately, this economy of space improves staff experience and patient care. The workstation on wheels also helps to prevent the spread of infections and communicable diseases. While it would seem that more people would end up using a mobile workstation and that they may be even dirtier than a regular computer, these stations are in fact used by fewer individuals and stay cleaner easier. Often built in with microbial protection, workstations also don’t build dust and allergens like static workstations and are cleaned often. Specific mobile healthcare displays can also help patient interaction and engagement. The ability to move and adjust screen positions and relay patient data to patients pictorially, gives the patient not only a sense of involvement, but can also prevent mistakes from occurring. There are many different types of workstations on wheels including medication carts, point of care carts, or you can design your own. For those health offices that have not yet adopted a mobile workstation, it is worthwhile to investigate how such modern conveniences can help improve workflow and efficiency with your staff and improve overall patient care.